This article provides you with a practical explanation of the Problem Definition Process.After reading, you will understand the basics of this powerful problem solving method. What is the Problem Definition Process? It seems obvious to think that problems tend to define themselves and that the focus should be on determining the consequences and looking for solutions. To some extent this is true. However, an accurate problem definition, to be achieved with the Problem Definition Process, simplifies the way to a suitable solution. Because the problem is defined analytically, the problem is examined from different angles and the problem definition process clarifies the points to focus on in the analysis performed on major critical problems. Problem Definition Process is a tool that can be used to compare different problems, for example, within an organisation or in a project, and can highlight general problems that were previously unclear. What initially appears to be the whole problem is often only a part or a symptom of a larger, deeper, and more complex issue. 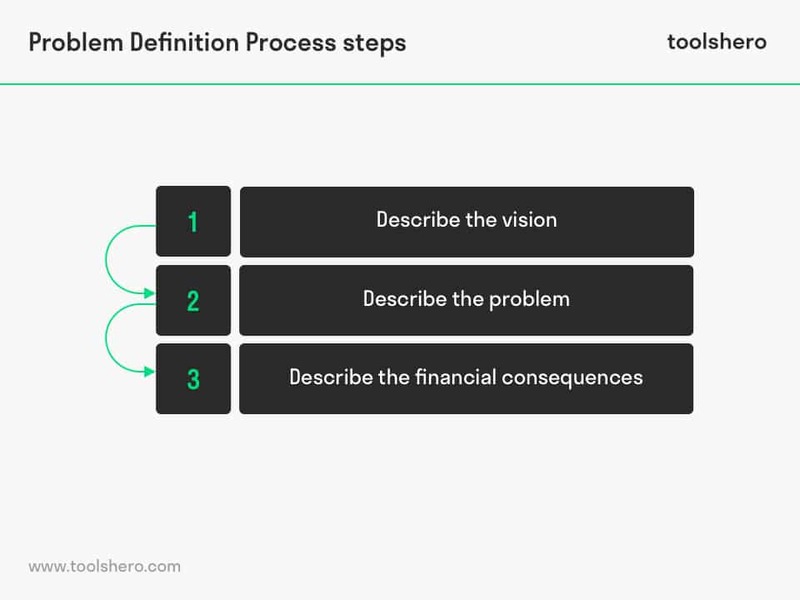 The problem definition process helps to visualise the problem, by presenting it from different angles and to help define the broader context and associated problems. Implementing the Problem Definition Process is especially effective when all stakeholders are involved. In this way, one can develop valuable insights about the size of the problem and its possible consequences. In addition, one can develop ideas about creative solutions, even if the solutions are not part of the problem definition process. However, defining the problem is essential before switching to, for example, a Root Cause Analysis, making an Ishikawa diagram or performing a cause-and-effect analysis. Start by describing how things should work in the most ideal situation. Before the problem is described or treated, a few sentences should be used to explain what the situation would be if the problem did not exist. Take, for example, the check-in protocol of a small airline. If every passenger has to check in at the airport, long queues develop as a result and this takes up a lot of time. An inefficient check-in protocol is time consuming and entails extra costs. This is a problem. After all, the aircraft has to depart as soon as possible. The check-in protocol must therefore be optimised, while making the situation understandable for all passengers. Accurately describing the problem is often half the work. Summarise the problem briefly and position the key information at the beginning of the single-phrase problem definition. In the case of the airline company, this could be that: The company’s current check-in protocol is inefficient in use. By wasting man-hours, the current protocol makes the company less competitive and a slower check-in process creates an unfavourable brand image. Once the problem is defined, it must be explained why it is a problem. After all, nobody has the means to solve every small problem. For example, if the airline transports 50 passengers per day, and if the current check-in protocol wastes about 6 minutes per passenger, this results in a loss of about 5 hours per day, which amounts to €100 per day, or €36,500 per year. A cost-benefit analysis, for example, can show whether the investment into an online check-in portal can be recouped. Approaching the problem with sufficient background information is advantageous, in that one can spot previously unforeseen issues. When engaging in the Problem Definition Process, use Lean’s “5 times why” method: who, what, where, when and why. While defining the problem definition, all five W’s should be fully answered. Who causes or can influence the problem? What would the situation be if the problem did not exist, and what is the situation in the future if the problem persists? When does the problem have to be solved? What are some questions that can be asked here? Is the problem temporary or permanent? Does this analysis of the problem possibly affect existing knowledge, practices or protocols? One thing to keep in mind when writing the problem definition is to keep it as short and clear as possible. The problem definition must not be longer than necessary and must be understood by everyone who reads it. Use clear, direct language and don’t get stuck in small details. Only the essence of the problem should be dealt with. Since it is likeliest that different parties will be dealing with the problem, it is important that everyone interprets the problem in the same way. Therefore, adjust the tone, style and diction accordingly. Ask yourself: for whom am I writing this? Do these people know the same terms and concepts as I do? Do these people share the same attitude as I do? As mentioned above, the problem definition must be written in such a way that everyone interprets it correctly. This means that, unless it can be assumed that the reader does have the right knowledge, technical terminology should be avoided or these terms should be explained. Problems do not often solve themselves, which is why it is crucial to address problems without wasting time or inciting other inefficiencies. Since more than one party is usually working on a solution to the problem, the problem definition is the most important part of the solution because different interpretations of the problem cause a lot of uncertainty. Uses the Problem Definition Process to define the problem definition. By describing the ideal situation, explaining the problem and determining the consequences using the “five times why” method, one will be able to think ‘outside the box’ and ensure that the problem is looked at from all angles. What do you think? Are you familiar with the Problem Definition Process explanation? What do you think are things that contribute to a clear problem definition? How do you apply the Problem Definition Process in your environment? Do you have any tips or additional comments?